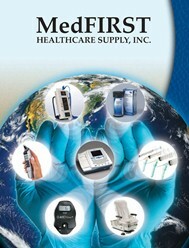 Welcome to MedFIRST Healthcare Supply! We have been in the wholesale medical business for over 22 years. Our mission to provide our customers and suppliers with the most responsive, efficient and cost-effective distribution system for the delivery of healthcare products and services in the market we serve, and to manage our business with the highest ethical standards in a socially responsible manner, with particular emphasis on the welfare of our employees and the community we serve. How will my equipment ship? Can I get an inside delivery for Exam Tables? Orders & Shipping to California? Your credit card will be charged at time of order. Shipping is calculated based on the items ordered. In addition Exam Tables, File Systems and Casework is calculate based upon the shipping option you choose. Shipping is only to the 48 contiguous states. To pay by check, simply add the items you want to purchase into our online shopping cart. Click the "Check Out" button and type in your name and address. Then click on the "Continue with Checkout" button. Simply print out the next web page and mail it to us at the address above. Be sure your total reflects any shipping charges and the address you want the shipment to go to. When possible, your package will ship via UPS. Common carrier truck deliveries are performed by a trucking company contracted by our suppliers. This service is a "Tailgate Delivery". Most of the time the driver will bring your new furniture to your doorstep. In rare cases the driver will move the items to the back of the truck. At that point you will need someone to move them into your building or residence. Can I get Liftgate delivery? Yes, for an additional fee if you choose this option. The delivery company will exercise due care at all times while on the property, leaving no debris or packaging materials behind. All Products are covered under the manufacturer's warranty. Please contact us for help with warranty issues for products you purchased through our company. We strive to carry quality medical equipment that will very rarely require utilization of the manufacturer's warranty. We strive to carry quality brands and deliver your new equipment in perfect condition. If you have any questions please don't hesitate to call, we will do everything we can to help you. The manufacturer's we represent also strive for exceptional customer service. We will do everything we can to make sure you are satisfied. In the rare situation that you experience damage in your shipment, please be sure to note it on the delivery paperwork you sign and contact us as soon as possible. If the carton is obviously severely damaged, please refuse the shipment from the freight company. We will arrange for a replacement or replacement parts to be rushed out. We will take the quickest route to remedy the situation. In the event a replacement is delivered to you before original shipment is returned, you are responsible for cooperating with the return of the item. Failure to return the damaged item will cause us to charge your credit card for the non-returned item. All returns accepted for credit must be in condition for restocking in their original package, unmarked, undamaged, and have been stored and handled properly. Merchandise returned due to customer error or overstock may be subject to a 25% restocking fee in addition to shipping fees. Please contact us and we will assess your situation. Items will not be authorized for return after 30 days from the delivery date. Your credit card will be refunded once the manufacturer receives the returned item. At this time, MedFIRST Healthcare Supply, Inc., does not sell or ship any orders into the State of California. We are sorry for any inconvenience this may cause.